All Skilman homes currently listed for sale in Skilman as of 04/20/2019 are shown below. You can change the search criteria at any time by pressing the 'Change Search' button below. If you have any questions or you would like more information about any Skilman homes for sale or other Skilman real estate, please contact us and one of our knowledgeable Skilman REALTORS® would be pleased to assist you. "Stately historic colonial residence rests majestically amidst lush lawns laced with mature trees in an arboretum-like setting. A long tree lined allee provides a dramatic approach to its vast sunny clearing and sets the tone for privacy, peaceful quiet and graceful living. Stone verandas on the front and rear balance the formal and casual spaces within and anchor the structure to its site. The residence has been sensitively restored while retaining significant vintage mill work and the rich patina of its original 19th century heritage. A formal entry foyer and elegant staircase is flanked by a massive living room with fireplace and dining room, where beyond french doors, the den is appointed with a fireplace and library shelves. The windows throughout the home are abundant and oversized, letting in a stunning display of natural light and verdant panoramas. The heart of the home is the open concept kitchen featuring white cabinetry, substantial walnut center island, soapstone counters, farmhouse sink and professional appliances showcasing a glossy burgundy AGA stove with multiple ovens. Open to the kitchen is the breakfast room and family room warmed by a stone fireplace. Its master bedroom suite is a serene retreat, bathed in diffused light containing a sitting area, full bath and walk in closet/dressing room. The second floor offers five additional bedrooms, one of which is en suite, two sharing a Jack & Jill bath (with one having access to a delightful third floor recreation room) and the remaining two nearby a hall bath. Two rooms on the third floor afford flex space for guests, office or countless possibilities. The 2-story barn, with some restoration, could be re-purposed for livestock, cars, workshop or studio. 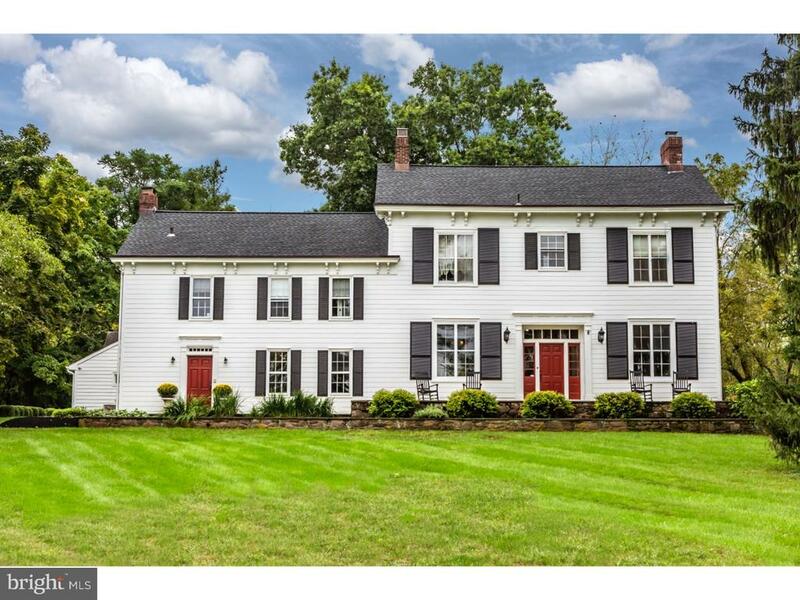 Convenient to Princeton and nearby towns renowned for their culture, shopping and restaurants, access to main roads and neighboring the Cherry Brook Preserve with walking, biking and riding trails, this is the ultimate country estate. Like all true cl"